Denny Hamlin and the #11 FedEx Racing team looked destined to visit Victory Lane and increase their lead at the top of the Chase for the Sprint Cup standings Sunday at Phoenix International Speedway during a truly dominating run but, in the end, fuel mileage undid their distinct advantage and relegated them to a bittersweet 12th-place finish. Hamlin collected bonus points for both leading a lap, and for leading a race-high 190 laps on the day to maintain his Chase lead heading to Homestead-Miami Speedway this weekend. To celebrate the on-track success of the FedEx Racing team, a total of 600 FedEx delivery vehicles in Dallas/Ft. Worth, Phoenix and Miami/Ft. Lauderdale markets will carry a special decal showing the company’s support for the #11 team’s Chase for the Sprint Cup campaign. This weekend will mark Hamlin’s sixth start at Homestead-Miami and his 187th career start at the Cup level. A year ago, with a championship out of reach, Hamlin and the #11 FedEx Racing team headed to the season finale at Homestead-Miami Speedway prepared to go all out for a race win, put an exclamation point on a successful season, and attempt to climb back into the top five in points. 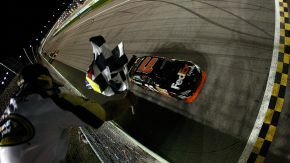 In the end, they accomplished all goals as Hamlin battled forward from his starting position of 38th to lead a race-high 71 laps and claim a first win at Homestead. In 2008, after a season and Chase full of up and downs, it came as no surprise that the final laps were nail biting for Denny Hamlin and the #11 FedEx Racing team. With a car that was as strong as any on the track at Homestead, Hamlin and team were put in the unenviable position of having to sacrifice track position for fuel with 12 laps to go. And, though several cars followed Hamlin off the track, or ran out of fuel on it, the cars that went the distance relegated Hamlin to a frustrating 13th-place finish. This team has made a habit of not qualifying particularly well at this 1.5-mile oval but generally run very strong come Sunday. Hamlin made his sixth-ever Cup start at Homestead in the fall of 2005 and it ended up being the ultimate learning experience as he found the wall both in practice and qualifying then fought handling to bring the car home in 33rd. 2006 was a completely different story. Coming to South Florida in the thick of the Chase for the Nextel Cup and looking to put an exclamation point on a record-setting rookie season, Hamlin drove an excellent race, bringing the #11 home in third place and locking up third place in the 2006 championship standings. The 2007 race at Homestead followed the same script as the 2006 edition – starting from deep in the pack; Hamlin wasted little time pushing forward and gained 15 spots through the first 18 laps. He would lead 19 laps on the day and run in the top five for most of the 267 laps before finishing an impressive third. The #11 FedEx Express Toyota will carry the letters SFL on the b-post this weekend at Homestead-Miami Speedway in recognition of the FedEx Express AGFS and U.S. Operations teams in the South Florida market. In addition to their commitment to customer service, the team is very involved in supporting FedEx community initiatives. The FedEx team will unload Chassis JGR 291 this weekend in Homestead. 291 ran, and won, two weeks ago in Texas. Chassis 285 will serve in backup duty. It’s all for the taking at Homestead this weekend – this is a scenario you said you welcomed, still this case? Did you imagine this Chase could be so tight going into the last race? Looking back at this season, short of winning the Championship on Sunday did you accomplish everything you wanted to?